Steamboats and shipbuilding are parts of Jeffersonville that have formed our community into what we are today. Thanks to a generous grant made possible through the Indiana Art Commission out of Indianapolis, Indiana and support from a Redevelopment Neighborhood Grant and the Jeffersonville Public Art Commission, a dead tree will regain new life! 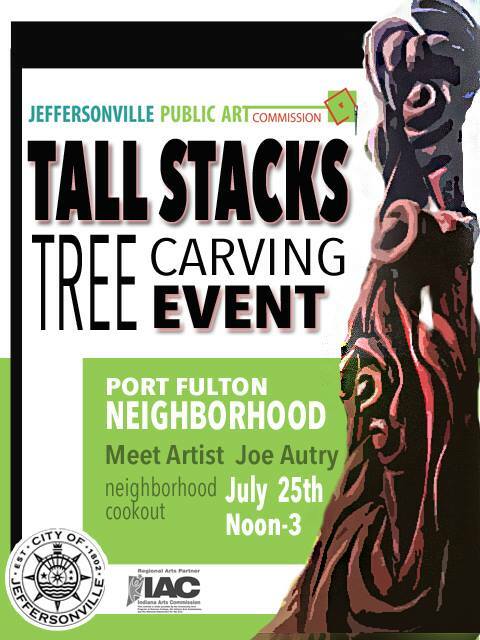 With a chain saw in hand, local artist Joe Autry will form a tree in Steamboat Park (Port Fulton Neighborhood) into beautiful wooden Tall Stacks! The sculpture will be created over a three week time. The location is Steamboat Park at the corner of Chestnut and Division Streets. Are you interested in meeting the artist? There will be an artist meet ‘n greet at Steamboat Park on Saturday July 25th from 12 pm-3 pm! Good food (thanks to Port Fulton Neighborhood Association) and creative dialog will be had by all who attend. Are you interested in watching the artist work? There will be a designed “safe viewing zone” (thanks to Jeffersonville’s Parks Department) within the park for curious community members to sit and watch the artist in action! Bring your own chair. Dates and times to view the artist will be discussed at the meet n’ greet made public on the Jeffersonville Art Facebook page as well as jeffersonvilleart.com.